Shipwrights of the North Sea is set in the early years of the Viking Age, circa 900 AD. As Viking shipwrights, players compete to build the greatest fleet on the North Sea. Players must collect oak, wool, and iron, as well as getting other craftsmen on board to help. 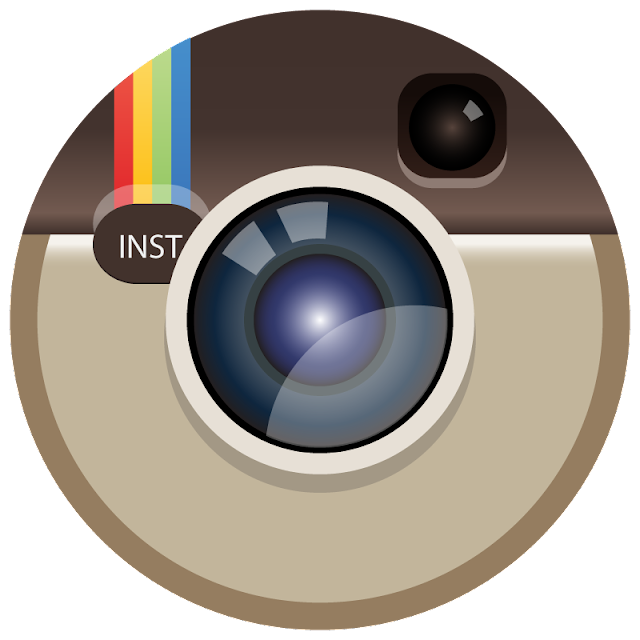 Gold is a precious commodity and must be spent wisely. As you would expect, the township is filled with an array of characters, bad and worse. Better hope they're on your side! Who doesn't love Vikings? 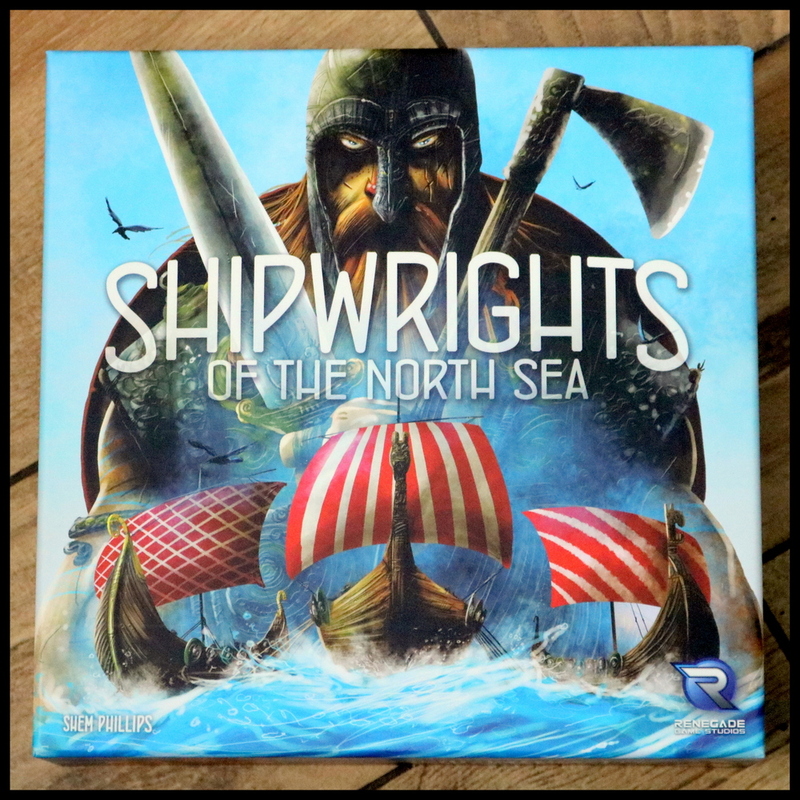 Shipwrights of the North Sea is the first game in the Viking-themed North Sea Trilogy of games (followed by Raiders of the North Sea and Explorers of the North Sea). 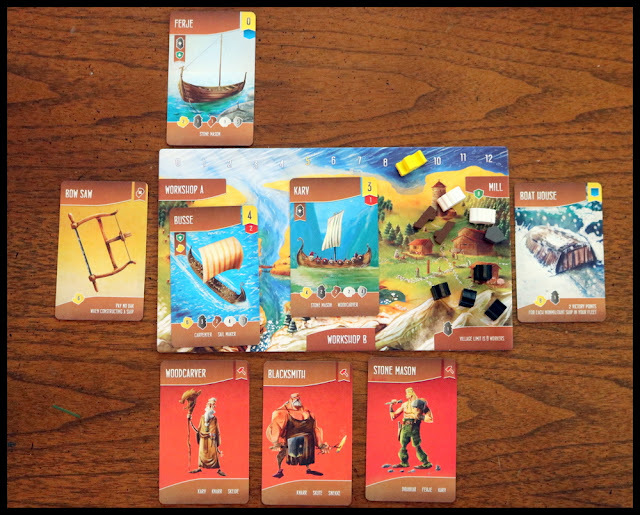 In Shipwrights of the North Sea, players work to gather resources, workers, craftsmen, and gold in order to create a seaworthy fleet of ships better and faster than any other Viking shipwright. The theme really feels solid, and my family is intrigued by the idea of a game trilogy! The mechanics of the game rely on card-drafting, hand management, and resource collection. 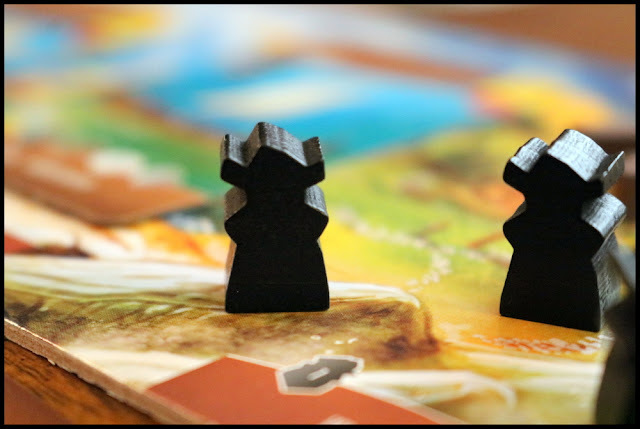 Each round flows smoothly into the next, and the mechanics are familiar - since we're used to card drafting (7 Wonders) and resource collection (Settlers of Catan) - but the combination felt fresh to us. 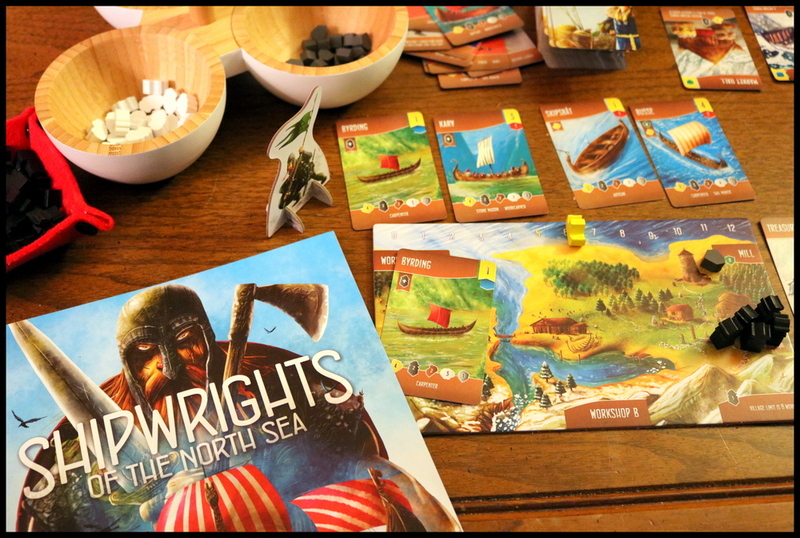 Shipwrights of the North Sea is a medium-weight game with a slim, well-laid-out rulebook and a quick and easy setup. All the cards (Ships, Buildings, Tools, Craftsmen, and Towsnfolk) are shuffled into one large deck of 128 cards, so there's no fussy shuffling and dealing of several decks. 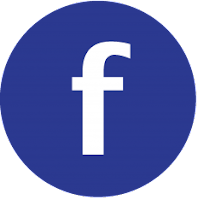 There are four basic types of wooden tokens (50 Workers and 25 each of Oak, Wool, and Iron) which simply need to be added to the table within easy reach. Each player takes one player board, three workers, two goods, and one gold ship, which is placed on the Gold Track on their player board at the starting level of five Gold. Setup (and tear down) is really quite simple, which means more of the game night time can be spent actually playing the game! The rulebook read quite well - we found only one slight typo (on page 11 the rules mention earning one Gold for every Worker in their Mill - according to the player board layout on page 3, Goods go in the Mill while Workers go in the Village. It's a tiny error, and we immediately realized what the author meant). We weren't confused and didn't find ourselves flipping back and forth between the pages to recheck things. The rules were clear and easy to teach, as well. We only found that we needed to refer to the rulebook for one thing (the order of things you refresh during the Evening Phase: Gold, Workers, Capacity). Each player has a Player Reference card which lists the kinds of available ships and their attributes. It might have been nice to have a quick gameplay overview on the blank side of that card, but we found we didn't really need it. 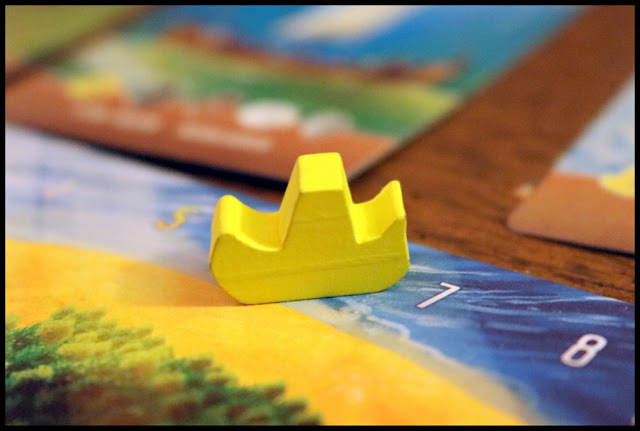 Play of Shipwrights of the North Sea felt so smooth to our family that after the first "day," we grinned at each other and said, "I really think I'm going to like this one!" Many of the mechanisms were familiar (card drafting, hand management, resource collection, commodity speculation), but the way they were woven together was unique from other games in our collection. The game is played through a series of rounds called "days." Each day is broken down into the Morning Phase for planning (card drafting to give you a hand of three cards), the Afternoon Phase for working (each player takes as many actions as they like and plays or discards all three cards), and the Evening Phase for resting (players receive Gold and Workers for the next day and check their capacity for storing Workers and Goods). The Morning Phase is a twist on card drafting - instead of each player having first choice from a hand and then passing it, the first player draws cards (equal to the number of players plus one), gets her first choice, and passes the hand around the table until everyone has one card, then repeats that process (getting first pick again) two more times until everyone has three cards in hand. This makes going first for the day a big advantage! The Afternoon Phase allows each player in turn to take as many actions as they like in whatever order they want. 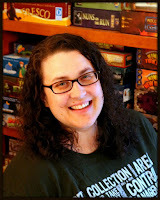 Actions may include playing a card, which can allow you to add a Ship to your Workshop, buy a Tool, hire a Craftsman, call on Townsfolk, or construct a Building. You can also buy Goods or spend Goods, Gold, Workers, and Craftsmen to construct a Ship. Choosing to buy Goods brings in a small element of commodity speculation - you can spend two Workers and two Gold to buy one kind of Good (Oak, Wool, or Iron), but you get as many of that kind as are shown on the back of the current top card of the draw pile (ranging from 1 to 3). This adds another layer of strategy, as you can attempt to choose the right time to buy the right Goods. Your use of cards is also somewhat limited - once you add a Ship to your Workshop, you can't remove it unless you construct it or it is targeted by a Barbarian (a Townsfolk card). The same idea holds true for adding a Craftsman below your board, so you have to be careful with what you choose to keep or what you might decide to discard instead of playing. All three of your cards in hand must be played or discarded during your turn on the Afternoon Phase. During the Evening Phase, players rebuild their Gold supply (depending on how many Workers you have on hand) and your Worker supply (depending on how your constructed Ships affect you), everyone discards down to their maximum number of Workers and Goods, and the first player Pioneer Token passes to the next player. Days continue in this simple cycle until the end of the Evening Phase on the day when at least one player constructs a fourth Ship. Victory points from constructed Ships, building special abilities, and a military bonus (from red points on constructed Ships) are added together to give your score. The art and components for Shipwrights of the North Sea is delightful! The art is a unique illustrative style with very striking characters on the craftsmen and townsfolk cards. We loved finding interesting details about the colorful characters. The Ship and Building cards and player mats were well illustrated, too. 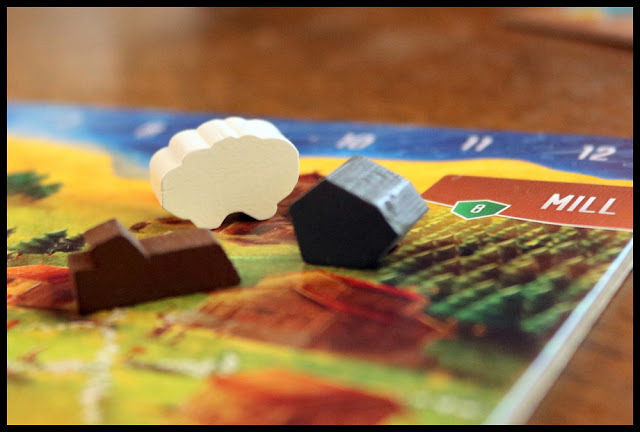 The wooden Goods and Worker meeples were nice, even though (before reading the rules) I guessed that the items were "sticks, rocks, clouds, and a big bag of windmills..." careful inspection (and reading the rules) turned these into oak branches, chunks of iron, fluffy sheep, and a big bag of horned Vikings! Almost everything about Shipwrights of the North Sea was positive, in our experience. As a homeschooling mom, I always think about games in terms of the skills they help my kids learn. Shipwrights of the North Sea is a fabulous way to work on executive functions - planning and preparation - since the cards you choose in your draft and your choices of what to play or discard drastically affect your ability to construct the Ships you've chosen. The commodity speculation mechanic leads to some good economic thinking, and the theme, illustrations, and Scandanavian boat names can get families thinking and talking about the history and culture of the Vikings. 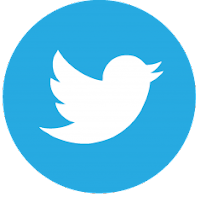 Lots of great learning opportunities here! As a game for game's sake - I can't say this enough - we found the game to be very smooth and quite well-balanced. (On our first game, my husband and I tied, and he only won because he ended with three more gold than I had!) It's medium weight, so you can bring quite a bit of strategy into it, but the rules and components are fairly simple and easy to learn. The first time we opened the box, it took us 90 minutes to learn the game and play our first full game; I would expect future games to be around or under an hour. The 2017 Renegade Games version of the game (as it was originally published in 2015 by Garphill Games) also comes with the Townsfolk Expansion, which adds a small worker placement aspect to the game, allowing players to spend one Worker per turn to choose an action from the Townsfolk board. At this point, I really don't have anything bad to say about Shipwrights of the North Sea. Aside from the one typo in the rules, I might have liked a little more simplicity and clarity for players, with a gameplay overview on each Player Reference card and an illustrated example of a player's full, mid-game tableau. 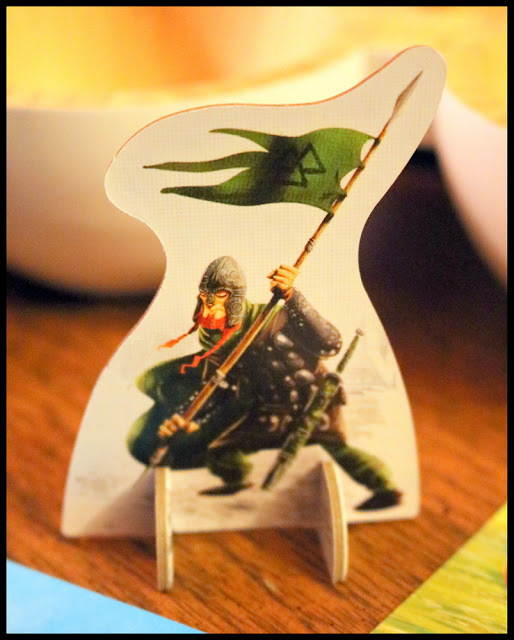 Overall, we were smitten like lovesick Vikings from our first playthrough of Shipwrights of the North Sea! As with any game, repeated plays may raise or lower our enjoyment of the game, but the good flow and interwoven mechanics will keep us coming back for more. We are also looking forward to trying out the next two games in the series, and I'm already imagining game nights where we play the full trilogy back to back! 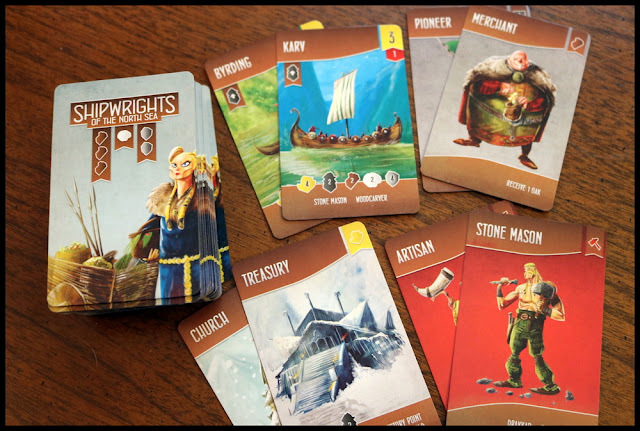 Shipwrights of the North Sea is a good game for players who enjoy card drafting games like 7 Wonders, or resource collection and hand management games like Settlers of Catan or Puerto Rico. 9 out of 10 super meeples.